Have you heard the news? Almo Professional A/V recently announced it is the exclusive U.S. distributor for Ecler Audio Products. As a result, Almo partners now have access to the complete line of Ecler speakers, audio players, matrixes, amplifiers and audio accessories. This can only mean good things for U.S. Pro AV integrators who can now bring the audio quality, product mix, support, price points and business model needed to compete for projects across multiple vertical markets. Ecler has a rich history. Based in Barcelona, Spain, Ecler is a respected, 54-year old global audio company that manufactures premium, professional audio products. It is one of the strongest audio brands in the world with distributors and integrators in more than 60 countries. Ecler has a unique focus on sustainability. Ecler specializes in taking care of the planet by developing products designed for energy-savings and manufactured with sustainable policies. 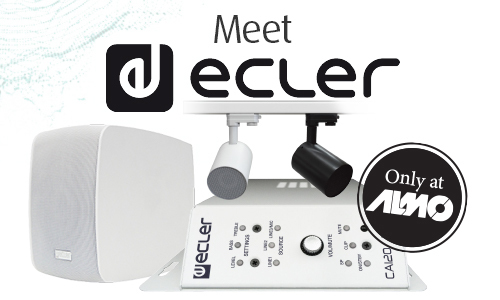 Most Ecler amplifiers use class D technology (90 percent efficiency) and Auto Standby function. Ecler works with big name global brands. Ecler has completed global audio roll outs for brands including Cartier, Burberry, Nike and H&M to name a few. Ecler products have also been used in countless corporate spaces, houses of worship, sporting venues, hotels, bars and restaurants. The primary applications for Ecler products is background music and paging systems. The Ecler line of audio products rolls up into Almo’s Sound Options dedicated audio sourcing and technical engineering group. In fact, Ecler is exhibiting in the Sound Options booth during Almo’s E4 Experience, which stops in Chicago March 12 and Los Angeles April 5. Check out this recent interview with Commercial Integrator Editor-in-Chief, Tom LeBlanc who talks to Almo’s Director of Business Development Rob Ziv and Ecler’s Sales Director Luis Hinojar.